"I was sitting in a perceptual psychology class," recalls Kaite Yang, a 2009 graduate of Dartmouth College, "learning about Purkinje trees-retinal blood vessels in the eye. 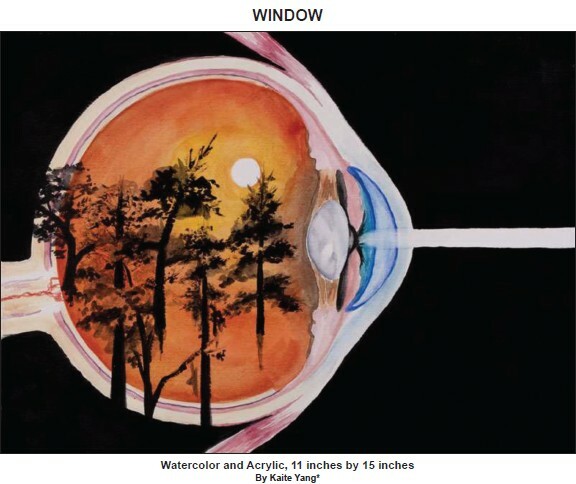 And I thought, 'It would be really great to paint real trees inside the eye.' "The result is ALCHEMY INSIDE, a set of works depicting parts of the human body "as carrying multiple associations, meanings, and references." She says. "I . . . regard art as not just the actual painting process, but the path of creatively formulating an idea." In 2010, Window was included in an exhibition at Johns Hopkins Hospital. Yang believes that "science and art have much to share and learn from each other in their methods and ways of understanding the world. I like to think that they are both trying to capture something true in the world and the experience of life, but through different processes and media." Yang seeks connections between art and medicine. She adds, I was always very struck by the beauty and enigma of the human body and its organ systems . . . my artwork shapes the way I try to look at connections between things that may otherwise seem totally unrelated. It's an exercise in mental flexibility."